While Bush pretends to carry out his oath of office, Americans flee this immigration invasion. In 2003, 800,000 Californians fled their own state. Tens of thousands of Americans fled Miami, Florida years ago with the Cuban invasion. If you live in New York, 1.5 million immigrants cannot speak English. Texas sounds and feels like a foreign country. With millions of illegal aliens and legal immigrants refusing to speak English, is this still America? What does the future hold if we allow our country to become a polyglot of cultures and languages? The short answer is–misery for all of us as our nation cracks up like Humpty Dumpty. Once that happens, “All the king’s horses and all the king’s men will never put Humpty Dumpty together again.” Bottom line is, Bush and Congress are running Americans out of our own country. We’re becoming a separated country. As if the constant gridlocked traffic and air pollution in Los Angeles weren’t enough, the physical results of the population increase on the design of the area are obvious. Open space has been converted into malls, cookie cutter homes and roads. One and two story buildings have been replaced with multiple-storied structures, and single family residences have been replaced by multiple-family dwellings. The result is greatly increased density. California grows toward an added 20 million in 30 years. Who in their right mind thinks 20 million more people added to the Golden State is good? If you do, you may make an appointment for a shrink! I’ll pay for it. “A more pedestrian-friendly environment is unrealistic in Southern California, where people live, work, and shop in different parts of the metropolitan area,” Powell said. 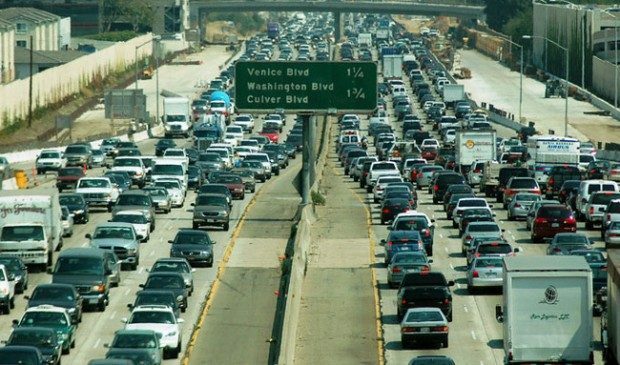 “Automobiles are essential in Southern California, so an increased population means lots more cars. While rush hours on our freeways used to be two hours in the morning and evening, the rush hours now extend from six in the morning to eight at night. A sobering aspect of Powell’s experiences finds harsh realities by the fact that California adds 600 cars to its highways and 1,500 new people every 24 hours—all due to immigration, both legal and illegal. Time Magazine exposed the borders being overrun at 10,000 nightly. They must go somewhere. California harbors over three million illegal migrants. More frightening is the fact that millions of people line up to come into America from around the world and that line increases by 85 million annually. Therefore, nothing is solved, but California has become a living manifestation from the movie, “BLADERUNNER” with Harrison Ford or “SOYLENT GREEN” with Edward G. Robinson and Charlton Heston. “Schools are bursting at the seams with too many students,” Powell said. “New students are added weekly with many different languages represented. Our nation’s classrooms suffer dumbing down to fit the levels of education from millions of kids of other countries. Those immigrants kids find themselves ‘graduated’ out of high school with no ability to read, write or think past the level of a third grader. No First World country can long exist with such an illiterate population. Not mentioned by Powell is the terrifying fact that 16,000 new cases of tuberculosis have been imported into the United States in the last six years. Another 7,000 new cases of leprosy spread throughout the USA. Tens of thousands of cases of hepatitis “A” roam across the land inside the bodies of unscreened illegal aliens. Chagas Disease, a T-cruzi parasite that affects 14 million people in South America and kills 50,000 per year make their way across our unguarded borders. Even more terrifying is the fact that California suffers three million illegal aliens and their kids attend public schools—thus, placing American kids at greater health risk for these diseases. Last year, four major hospitals bankrupted in Southern California. How many more will fail in 2005? “The huge population shift has also changed the stores available for consumers,” Powell said. “Many fine department stores have been replaced by discount stores. Quantity has replaced quality to accommodate the increasing lower economic class. The types of small-businesses are shifting as well. While the boulevards used to be filled with hardware stores, appliance repair shops, and nurseries, we now see a barrage of beauty shops, nail salons, dry cleaners, juice bars, and mailing stores. Consider, also, the stores that cater solely to the “new” immigrant population. Three Korean markets have opened within three blocks along the main street of her former town. They cover their windows with signage meant to attract only Korean customers. Long-time American residents are pushed out of their Southern California towns. Finally, the stress levels of day-to-day living have greatly increased as more patience is required to handle the diversity. When one enters the public arena, tolerance is needed for every transaction. Stress builds, and few people in Southern California are smiling or pleasantly interacting with others. The demand for patience simply wears people out. These people no longer are Americans, don’t speak English, don’t have any investment in being an American. They’re building their own separate city-states within America’s borders. Yeah, right Mr. Bush since you are not one of the 15 million Americans unemployed nor do you have to live in this American Dream now turned American Nightmare. Why not talk with Jane Powell for her personal opinion of your presidency. It may go down as one of the worst, most incompetent presidencies in the history of the United States of America? On the hom page, click on www.americanvoiceradio.com heard around the world. Five nights a week, Edwards engages patriots from across the nation to bring you the latest on this nation-destroying invasion. Frosty Wooldridge has guest lectured at Cornell University, teaching creative writing workshops, magazine writing at Michigan State University, and has presented environmental science lectures at the University of Colorado, University of Denver and Regis University. He also lectures on “Religion and Ethics” at Front Range College in Colorado. READ 2007: Did U.S. use neutron bomb in Battle of Baghdad?